Penalty Shoot-out football game in Flash. Licence this game or buy the source code. Penalty shootout is a frequently requested web game, combining both a very popular sport with a wealth of rebranding opportunitues. With the amount of sponsorship and commercial opportunites involved connected with both professional and amateur football (soccer), this game can fit a wide variety of marketing campaigns, from local small-business non-league sponsorship up to the level of premiership high end corporate involvement. With the worldwide popularity of football, the game is also suitable for many international markets. The gameplay is developed with a one-click kicking system. This does away with the need to set both the power and then the direction of the ball. One-click sets both and kicks the ball in this game; the user is presented with an instruction screen about this the first time they play. The game is one-player only, taking it in turns to play shots against the computer (CPU). Football is a heavily sponsored game, and this game gives those same opportunities. There's space on the title screen for a logo, advert boards behind the goalie (which could be animated), the goalie's kit and chest-area for recolouring and logo placement, and the ball itself which can also carry a logo. Looking for source code / Actionscript / .fla file for this penalty shootout game? The source code for this penalty game is available to buy from Galaxy Graphics. 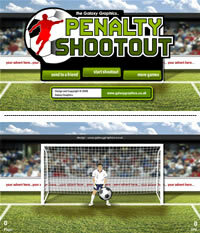 Click here to contact us about Penalty Shootout source code.